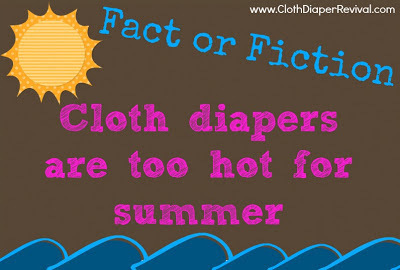 Cloth diapers are a great option for summer (or any weather). Here are some tips for keeping your little one's hiney from being too hot or sweaty! Natural fibers allow for air circulation which will prevent the heat and moisture from being trapped inside the diaper area. When you think of wool, you probably think of winter sweaters, but the truth is, wool is great all year round! Wool is breathable and allows air to flow. Your baby will stay cooler in a wool cover. Wool is also more breathable than a PUL cover. Use a flat, prefold or fitted diaper and let your baby go completely coverless at home! Of course, you'll want to keep an eye on things. The first time your child pees, it will not soak through the diaper and drip all over the floor. When you notice dampness on the outside of the diaper, you'll want to change. I put the sprinkler on in our backyard to cool the kids down. We eat lots of ice pops! Slash pad at a local park! Always loads of fun! I like to take my kids to my parents house and hang out in the pool! Our kiddie (and puppy!) pool will get lots of use I'm sure! We love to fill up the kiddie pool in the backyard and all climb in. Find a shady spot at a park. We think cool thoughts! Lol! Seriously though, we try to be chill. We don't do a lot of rushing and to-ing and fro-ing. We mostly just try to stay laid back and relaxed in our schedule and activities. Going to grandma and grandpa's pool! We have the kiddie pool full almost every morning so it's warmed up by the hot afternoon. We love swimming at the local beach, too! I'm a big fan of my in-laws pool! Never been pregnant before and summer is no joke! Our babe isn't due until August, but I plan on hanging out in the pool we have in our backyard :) Thanks for this opportunity! Air conditioning or the shade LO is only a baby! Lots and lots of swimming! We are full on beach bums in the summer! We live along a river so we get a great cool breeze over the water when we go for walks through the park along the river. The free splash pad down the road!!! Our kids love the wading pool (leftover water is then used to water the garden). Going to a swimming pool!! I plan on putting my newborn, due at the end of August, in flats without a cover to help keep her cool. My son was a winter baby and was old enough to go diaperless for some time during his first summer. Go to a splash park! Swimming in the pool...hopefully the little one will like it a bit better this summer! The pool and slip n slide! homemade popsicles and playing with the hose are our favorite ways to stay cool! We go to the splash pad at least once a week. We love going swimming at my moms in a small kids pool and the local splash pad. Luckily we have an air conditioner for when it's too hot to leave the house! I don't have kids yet, but I always go swimming in a natural spring! We love the local spray grounds or filling up the pool in the backyard. We like to eat Popsicles! Living in Texas, the only cool places are inside with a/c or in a pool! We have been beating the heat in our new baby pool!! I can't wait to take my little girl swimming for the first time this summer! we have a splash pad at our local park and it is really fun! that they are too hot is crazy, disposables are HOT they are not breathable at all! plus you can remove your insert and use most diapers as a swim diaper, fun fun fun! I don't know, this will be my baby's first summer! Interested in taking her swimming! we go swimming in the creek!! well, swimming of course, and playing in the sprinkler, and eating popsicles. Lots of shade, home made sun block and water! play in the pool and eat frozen treats (popsicles, icecream, frozen grapes for older kids). Last summer I was pregnant, and we would swing on the porch and play with bowls, spoon and cups in water. This summer we have a baby pool, sprinkler and umbrella for the back yard. It will be our first summer, but I see the pool and hanging out in the park under a nice shady tree! Swimming pool- big neighborhood pool or small plastic one in the backyard. Swimming and the ice cream man. Can't keep ice cream in the house. It wouldn't last. I agree that coverless or wool covers are the best in the summer heat! letting them splash in whatever available water there is. rain on the deck chairs, creek, etc. We are big fans of the splashparks around the city! I don't have any kids yet (due in July! ), so this year we'll probably stay cool in the a/c... hopefully next year we can hit the pool! Hanging out in the pool! Hanging by the pool or beach of course! We love eating popsicles and swimming! Swimming and the local splash pad! Snow cones, Popsicles and water sprinkler! Baby pool in backyard or getting out on the lake! This will be my first summer with my LO, so we'll see what we come up with! Put on a swim diaper and head out to the pool! we have a little kiddie pool on our patio and we BOTH go sit in it when it's hot out. and popsicles!! My kids love to play in the pool! This is my first summer with a little one, lots of shade is my plan! Stay inside during the heat of the day...go outside in the morning or late afternoon! G loves to run through the sprinkler and play with his water table. Swimming in the pool, or going to the beach! we have a kiddy pool and thinking of getting a sprinkler! My kids love to play in the creek on our property. Ditto playing in the creek! We love to play in the sprinkler and water table. The sprinkler is always fun. A favorite of mine is to make a mini-swim pool out of our little red wagon and let the kids sit in it! Our complex has a kid friendly pool, plus hitting up the library on a super hot day is always fun. We like to play in the sprinkler in our back yard or go to a local park that has water to play in! Definitely the sprinkler! That way everyone, including the family dog, get's to be cooled off! Going to the free splash pads in our area. Swimming and homemade fresh fruit popsicles!! Squirt guns and watering hose. We are looking forward to the new aquatic center in our local rec center. We play in the pool! We play in my daughter lil pool or we go to the beach! We love to spend time in the pool! We play in my daughter's baby pool. Taking them to the lake to swim! Sprinkler, slip n slide, kiddie pool, and ice pops! We love going to the pool with friends ! Swimming, swimming and more swimming! I like to stay indoor and the kids love going to the pool! Going to the pool, eating snowballs (shaved ice), ice cold lemonade, and chilled melon. Frozen treats, lots and lots of frozen treats! Spending time in the shade and staying hydrated! We love going to play at the lake! The local splash pad and grandmas pool. Still trying to convince hubby that wool is cool! water play! we love our kiddie pool!! I'm having my first this July so I'll use all these "cool" tips. Thanks! Water! We either play at home in the sprinkler or kiddie pool, or we go somewhere like the local park, river, or lake. The kids love it, and it's so relaxing! We love to have water gun fights!! My oldest and I love to team up against my hubby! I don't have kids yet, my first is due this fall. I stay cool by going to the river or lake. We hang out inside, living in Arizona it gets too hot but when we are outside we hit up the pool. We are a 5 minute walk to the beach and take full advantage of it. We are very lucky to be close to a couple beaches!! We love playing in the pool or heading to the lake! We use a sprinkler and/or kiddie pool in the backyard to stay cool in the summer. Sitting under the shade trees drinking ice cold drinks and playing in the baby pool. Cool damp towels around our necks! I like to go to a nice sandy beach. Hard to find locally though!